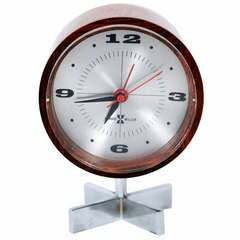 An unusual 1950s table clock, shaped like a TV. Great 1950s look in the style of Howard Miller. Case in walnut with brass angled legs. 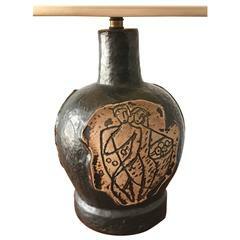 An unusual 1950s ceramic lamp with stylized decoration. Astonishing French table clock in wood, 1950. A decorative black glass clock with églomisé roman numerals. The piece is held in an elaborately carved drop frame. The clock winds up with key. In good condition. Bakelite railway clock produced by Pragotron in the 1950s. Kept in its original good condition. Has a new battery operated quartz controlled drive.